Space Hulk: Deathwing has released a new trailer showing a bit more about the sort of gameplay we can expect from this adaptation of Space Hulk, developed by French outfit Struem On Studio, the team behind flawed co-op blasted E.Y.E Divine Cybermancy. Perhaps you want to experience the calm aspects of space instead of this horror? We’ve got a list of space games you really should try out. My first thought watching the trailer is that they’ve come a long way since E.Y.E here, a game that was a lot of fun but was filled with odd interactions and janky mechanics. 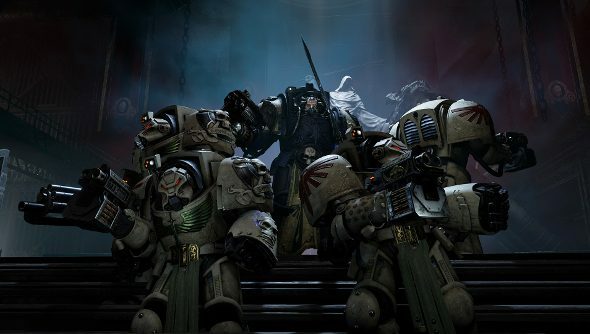 Space Hulk: Deathwing seems more like a Warhammer 40k edition of Warhammer: Vermintide. Watch the trailer, then come back here and we’ll compare notes. So, it’s a 4 person shooter, rather than a faithful adaptation for the boardgame and it looks, primarily, terrifying. This is the first time we’ve seen gameplay, and the Genestealers are horrifying, and even the fact you’re clad in solid terminator armour probably won’t help the terror. A cool feature is the localised damage to your suit of armour, Terminator armour is big and heavy and assisted by servos. If it takes damage, parts stop working, and this means that during gameplay you might lose the ability to use weapons or gadgets as the fight wears you down. Every Spacehulk is taken from the lore of the universe and will have a different aesthetic depending on the race that originally owned it. It looks like a solid blaster, hopefully we’ll see more on it in the run up to release.